Let’s talk about things that are ugly. Some things that come into my (Celine) mind are suburban strip malls, rainy slush in the middle of winter, gum on the sidewalk, and the mood inside Congress on a normal day. All bad things, inside and out! But then there are ugly things that are actually good, like extremely worn out and waterstained books (like my copy of Hamlet, which I accidentally soaked with an entire bottle of water, along with the rest of my school books…), a comfortable but scuffed up old pair of shoes, and this apple cake. I am not pretending this cake could, would, or should win any beauty contests, because let’s face it, it is pretty ugly (not to mention that my let-me-take-this-picture-in-30-seconds picture does it no favors). But I can promise you, without a doubt, that it is delicious. 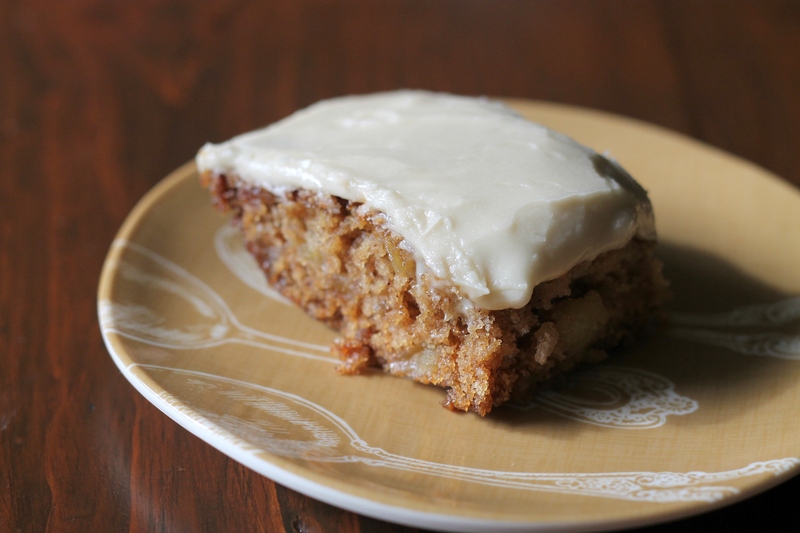 The cake is sweet and perfectly spiced, with soft pieces of apple strewn throughout. The frosting is the really delicious (albeit unattractive) part. It is pretty close to heaven. You melt together brown sugar and butter and milk, let it boil, and then add powdered sugar and spread it over the top of the cake. This cake is not only simple but it is really, really delicious and a nice breather from pumpkin flavored stuff all the time in the fall. Preheat oven to 325°F. Grease and flour a 9 x 13 in. pan. In a large bowl, beat together the dry ingredients, sugar, butter, and eggs. Beat until well combined and stiff but cohesive. Stir in the apples and nuts, if using, until the mixture becomes thick batter (slightly less thick than cookie dough). Pour batter into prepared pan and spread with a spatula. Bake the cake for about 45 minutes or until a toothpick inserted in the center of the cake comes out mostly clean. Let the cake cool in pan on a wire rack. Melt the butter in a small pan over medium heat. Stir in the brown sugar and cook while stirring until the sugar has melted. Add the milk and bring the mixture to a boil. Let cool for about 10 minutes. Sift in the powdered sugar and vanilla. Beat together (add more sugar if necessary if the frosting is too thin). Spread the frosting over the cake and let set slightly before serving. Cut into squares, serve, and enjoy! Oh I love this!! Looks fantastic! Soo moist!! Ahh I have to try it! It is really moist! I hope you try it- it is truly delicious, especially the frosting!